Chances are that at some point in your life you have watched a court television drama of some sort and therefore, you are mildly aware of how a trial works. In almost every episode, one of the litigators will call to the stand an “expert witness” to testify on behalf of some important part of the case. When it comes to personal injury cases, expert witnesses are often extremely important as their testimony can often determine what the final outcome of the case will be. Continue reading below to learn more about what sort of expert witnesses can be called to the stand and why each of them can mean you winning or losing your case. An expert witness is someone who has special experience, knowledge, skills, training and/or education that allows them to testify to certain facts of a case while it is in court. Much of the time, your attorney will have to hire expert witnesses in order to refute inaccurate testimonies that have already been given, or to act as your defense. These types of witnesses are often some of the most important to testify during a trial as what they say should be taken at face-value, seeing as how they have nothing to gain by giving false testimony. 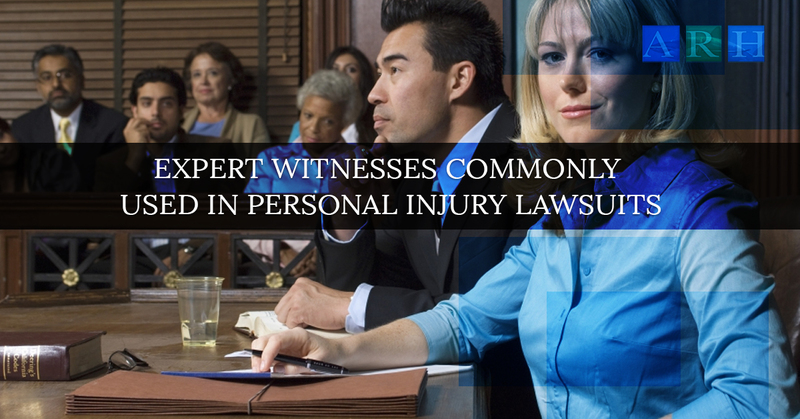 There are many different types of expert witnesses that can be called in a personal injury case. Each of them can play their own role and offer something different to a case. Let’s talk about some of the most common types of expert witnesses. While you may not have known that this was an actual profession, there are people known as car accident reconstruction specialists who can consult you in collision analysis, reconstruction of the accident, the injuries and crashworthiness. This professional can provide accurate details like how fast the cars were moving when the crash occurred, as well as things like who had the right of way, steering angles, braking and more. There are people who are employed by the Department of Transportation who act as regulations experts. This means that their job is to ensure that products like tires, airbags and more are tested for safety properly before they are put on the market. A DOT Regulations Specialist may be asked to act as an expert witness in a case that is thought to be caused by DOT regulations that were not meant and therefore caused the accident. There is data stored in a vehicles’ ECM (electronic control module) and its EDR (event data recorder) that can be interpreted to show was the vehicle’s actions were right before the action occurred. Having a ECM/EDR specialist testify in court as an expert witness can make or break a case as it will either validate what the injured party is claiming to have happened, or disprove it. Any police officers, EMTs or firefighters who were present at the scene of the accident can testify as expert witnesses in a case. Seeing as how they witnessed the accident first hand, these people often have special knowledge concerning the incident. Family practice physicians and medical doctors make great expert witnesses as he/she can review what sorts of injuries occurred because of the accident and give an objective opinion in regards to them. They can also determine what the appropriate course of action should be in regards to the injured person healing. This expert witness will likely testify on the degree of injury, level of disability and what treatment plan should be in place for someone who suffered a brain or spine injury in an accident. Seeing as how brain injuries can often mean multiple years of rehabilitation, the testimony of a neurologist can be extremely helpful in winning a case and you receiving the settlement you deserve. If you suffered any orthopedic injuries in your accident, having an orthopedic surgeon to act as an expert witness is a great idea. This professional can attest to any sort of surgery you had to undergo post-accident as well as the level of disability you have experienced due to the accident. If your injury left you with chronic pain, a testimony from a pain management specialist can really help your case. This type of expert witness can explain the extent of which you are in pain on a daily basis ever since the incident occurred. Additionally, they can go into detail about how this chronic pain can affect other areas of your life like your ability to perform your job, your potential earning capacity and your lifetime expectancy. If you aren’t experiencing chronic pain but your injuries have affected your career in any way, a vocational specialist may be the best expert witness that your lawyer can call to testify. This expert can testify regarding the types of jobs that are available to you now that you have sustained such injuries. They can also show your diminished earning capacity now that you have been injured and how that injury is preventing you from doing your job to the best of your ability, therefore negatively affecting your livelihood. Knowing you have a personal injury attorney on your side who knows how to win your case is extremely important in a time like this. At Alex Hernandez Trial Law, you can be sure that we know exactly which expert witnesses to call to the stand, as well as what questions to ask them. We will do everything we can to help ensure that you get the settlement you deserve so that you can get your life back on track after this awful event. Should you live in San Antonio, Corpus Christi, Victoria or surrounding areas, be sure to call us right now. We will begin working on your case as soon as we can!